Last year at this time I was musing the year that was. However, this time around I just didn’t have the motivation to look back. Overall it was a sub-par year for me. There was a metric assload of rain in July and August and my total miles were down around 25%. Now it’s January and I am wrestling with the traditional winter issues of weight gain and trainer rides. I need to look forward, not back. It’s time to do a status check. Here’s what’s going on right now: Starting 4-ride weeks on the trainer. I have just enough cycling clothes to do this. They will take the form of two interval workouts and two tempo rides. I need to increase the volume and I don’t want to burn myself out on constant lung-burners. No January Champions here. I’m going to do one tempo ride on the weekend and fit the other three in mid-week. This should be a fun exercise in reovery. I want to train for a century this year, but not like I have done in the past. No, this will be what I’m calling a “Circuit Century”. This past summer I added a loop route to my stable of rides. It measures about 10 miles per lap. Yep, I want to take a shot at 10 laps. Speaking of riding longer distances, I need to give my most precious contact point greater support. More specifically, the Canari Velo II shorts I have had since 2006 are nearing the end of their run. 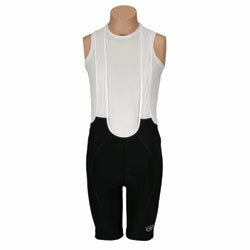 I bought a pair of Performance Elite bibs with a gel chamois, and mostly like them. The gel chamois is a little rough at times, but nothing a little chamois cream shouldn’t help. I’d like to get a couple more of these, but experience tells me to go for the foam padding. Ride and learn. A quick check over at Winning Stats shows I had 11 rides for November. Not bad, considering that my goal every month is for 12 rides. I consider three rides a week to be a good pace. It’s also a good number of rides considering the paltry amount I did over the summer. We set a record for rain here in July, and August was only slightly better. I think I had 12 rides over the course of two months. Blech. Factor in that I packed it in during the second week of October, and the road season this year sucked. I’m glad that the Sufferfest is putting out new material, as I’m finally fully adjusted to trainer mode. I think that I’m learning what training works best for me during these cold, dark months. The outright thrashing of some of the Spinervals videos isn’t what I’m looking for. I guess that the Sufferfest is dishing out similar punishment, but I have a good time doing them. The Trainright workouts seem to work well also, but they leave me in better condition afterward. I feel that I definitely put out a hard effort, but I recover from them better and feel that I get a stronger fitness gain. I have also been reading about the classic off-season “LSD” (Long, slow distance) theory of building the base. Since I’m not a racer, I can feel free to take my own approach. What seems to be working so far is mixing in at least one mid-tempo hour-long ride per week. I throw in a time trial-esque 10 minute high aerobic interval to make it a little harder, but it’s just a good calorie-burner. The mix of tempo and interval workouts is feeling like a good mix. I just have to be able to keep at it and hope for better weather come April. Most of us cyclists have a handful of reliable routes that we ride. I am no different. Whether I’m heading south into Vischer Ferry or north and west toward Charlton, my routes are a point to point affair – beginning and ending in my driveway. Surprisingly, one thing that had never occurred to me was to define a loop course and do laps around it. About a month ago, I decided to do just that. It took some getting used to, but I now consider it a welcome addition to my cadre of routes. Directions: It’s weird riding 11 miles and only making one left turn. Like most of the terrain out here, it’s rarely flat for more than a half mile. You’re either going up or down. Poor man’s hill repeats: There is a nice Berg about 5 miles into the loop. Every lap takes me up it one more time. Passing the finish line (temptation): I always set out with a predetermined number of laps to complete. However, if it’s one of those days that I have dead legs, it’s very tempting to just bag it early when I see the start/finish line. I haven’t done it yet, but it has crossed my mind. Also, there are two points along the way where I can take a shortcut home. I always ignore them and consider them for emergencies only – a storm fast approaching, a mechanical problem, bonked, injury, etc. A nice way to measure out a ride: It’s almost exactly an 11 mile circuit. I ride about 2 miles total getting to and from it. That way, it’s easy for me to know how many calories to bring along and about how long the ride will take (One loop takes about 40-45 minutes). It’s funny, but when I do the longer point-to-point rides, I feel weird not doing the whole route. When I ride the loop, it’s ok to only do one circuit because I’m crunched for time. All in all, I’m glad I did it. Once again I prove to myself that there can be something more to discover on roads you’ve ridden countless times. Why The Hell Am I Doing Hill Repeats? So I did a hill repeat ride this week. It consisted of 5 trips up a grade on Schauber Road. Each climb only took a few minutes, but the recovery between each was about the same time. After the third repeat, I had that “why am I doing this?” feeling. The fourth one really hurt. By the time I started the last one I knew that was it, so I eased up mentally – once I separated my mind from the sting in my legs I was really gliding up the hill. That probably impressed me more than anything else. I finished up with about 10 miles of flat to rolling terrain. I sure felt it the next day, but it wasn’t that bad – a good hurt. It was about 150 feet gained each time and I definitely went into the red zone in the final 200 feet or so. According to Map My Ride there was a section at 13%! But it begs the question – why do it at all? There’s something to be said about the purity of the effort but I think it goes a little past that. I’m not training for a race or anything that has a lot of climbing – I just want to impress myself. Prior to my time as a “serious” cyclist (about 5 years now) I was never an athletic person. In high school, I got a JV letter for bowling – an activity that can be aided by beer. In some small way, suffering up a climb gives me a sense of worth. I know that I could never have dreamed of being able to do what I did on this ride back in my 20s. I guess the old saying “because it is there” applies here. I hope I can wax so philosophical when I assault Lake Desolation Road later this year. Round 1: So Friday was forecast for 72° and sunny; great day for a ride on my recently-serviced bike. I get out of work early and hit the road. I was in great form for April. The uphills were nothing remarkable and I had good legs for the entire ride. I covered 39 miles in a little over 2 hours. I felt great – I really needed a ride of some decent length for a change. The only buzz kill was that my rear derailleur was out of adjustment. The shifts were vague and sometimes skipped. I’m no wrench so I took it to the LBS and they fixed it gratis, because they’re good like that. Turns out the shifter cable was stretched. No biggie. Round 2: Today was forecast to be sunny and unseasonably warm – we actually set a record at 89°. Considering that the average high for this time of year is in the low 60s, it took some getting used to. I was psyched to get out and get a nice long ride in. The bike was running smoothly during my warm-up and I had my sights set on a route to Vischer Ferry. Depending on what options I take on the route, the Vischer Ferry ride can take over 3 hours and top out around 60-65 miles. I didn’t plan on doing the entire route, but I wanted to do at least 2½ hours worth. I felt pretty well recovered from the previous day’s ride and had earlier done a nice hour long walk with Mrs. Stallion. I felt so-so during my warm up – small ring, 1.6 miles, 7 minutes. The heat was immediately apparent, but I had ridden in worse conditions in mid-summer. At least it wasn’t humid at all. I didn’t feel right from the get go. I had noticeably low power, and every effort I put out left me gasping and leaning heavy on the handlebars. In my head I thought, “You’re not recovered from Friday, take it easy”. By the time I was half an hour out, I’d had enough. Go home. That was a long ride back. The hot weather was the kryptonite to my power plant. I guess I have to acclimate to the hot weather naturally. A sudden spike in Spring temps isn’t necessarily a blessing. Lesson learned. You are currently browsing the archives for the Rides category.